I saw this on the shelves and couldn’t pass up this strange seeming concoction. While it may seem strange, this beer actually makes a lot of sense when you note that it is part of the UK Rainbow Project which is in it’s 3rd year now. The idea behind the project this year (brainchild of Siren Brewing) is to get US and UK breweries to collaborate on a beer that is influenced by one of 7 colors they are assigned. Some of you Minnesotans may have noticed that our own Surly Brewing also participated in this project this year. In this case Crooked Stave and Hawkshead Brewery were assigned Green. Crooked Stave from Denver, Colorado has been in our market for about a year and I’ve enjoyed the few funky beers from them I have had the chance to try over the years. I know even less about their collaborators Hawkshead Brewery out of Kendal, UK but from reading their website it sounds like they have their priorities straight and as a Minnesotan I have to respect their tagline of “Beer from the lakes”. This beer aged in oak with lactose, fresh lime and fresh lemongrass is sure to be unique. Bottled July 2015 in a 375ml bottle. Pours a lovely bright, slightly brownish, orange hue with a solid two fingers of off white head. After fading a centimeter or so of lacing persists giving this beer a very nice appearance. Initial aroma is quite tart with significant lime. After a few moments the intensity subsides and the herbal aromas of lemongrass shine through, complimented by black pepper and mild plant matter. Taste is notably tart with lime character dominating the palate initially but being moderately smoothed out with the herbal lemongrass. The more I drink it the more the herbal character shines in the finish making this beer quite refreshing and surprisingly drinkable. Mouthfeel is a touch syrupy, but the body is rather light though not too thin. While not woody the oak aging of this beer produces a smoothing quality as expected, but also creates interesting flavors when contrasted with the lime that remind me of light pitted fruits, particularly apricot. 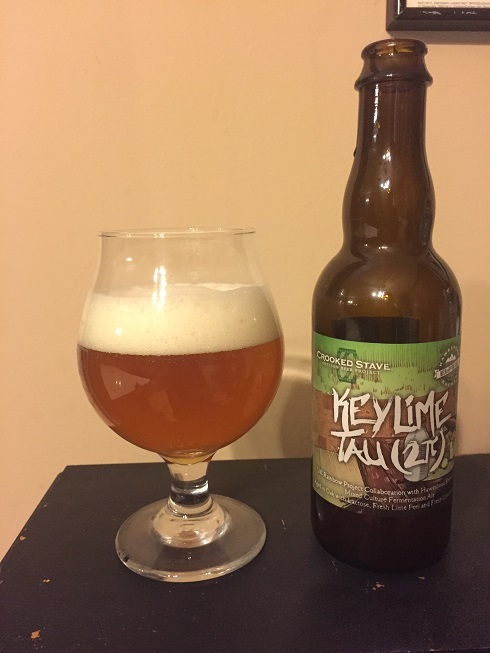 In addition to the oak, the lactose does a very good job complimenting and contrasting the intense lime character of this beer, particularly as it warms. At 7% ABV this beer is higher on the scale for the style, but isn’t going to hurt anyone, though I do wish it was served in a bigger bottle. I was initially a bit concerned I might not want to drink too much of such a lime forward beverage, but the more it warms and the contrasting characters of lime, oak, lactose and lemongrass shine the more I truly enjoy this beer. Give it a shot and ride your bike. This entry was posted on Friday, October 16th, 2015 at 5:23 pm	and is filed under Beer. You can follow any responses to this entry through the RSS 2.0 feed. You can leave a response, or trackback from your own site.